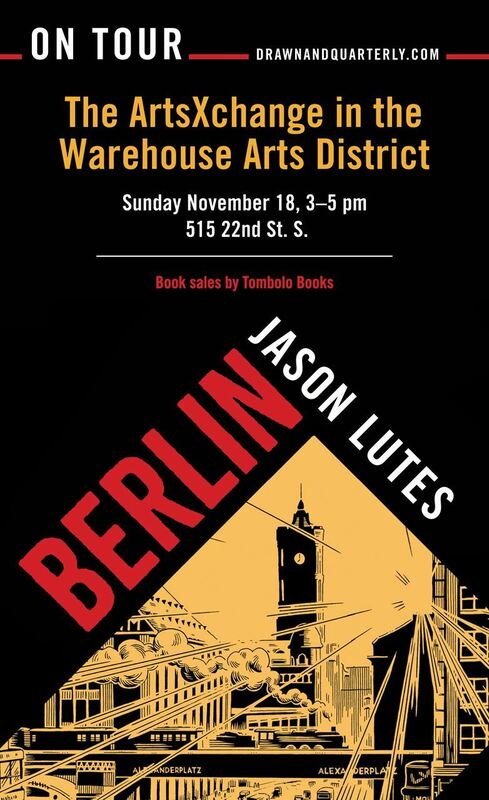 Tombolo Books and the ArtsXchange present cartoonist Jason Lutes and his epic graphic novel, Berlin. Twenty years in the making, this sweeping masterpiece charts Berlin through the rise of Nazism. St. Petersburg, FL – October 22 – St. Petersburg’s newest independent bookstore, Tombolo Books, in conjunction with the ArtsXchange in the Warehouse Arts District will host cartoonist Jason Lutes to celebrate the publication of the third and final paperback installment of Berlin (Berlin: City of Light, Drawn and Quarterly, 168 pages, $24.95), as well as the hardcover omnibus edition (Berlin, Drawn and Quarterly, 580 pages, $49.95). The art and book talk is open to the public and will be followed by a book signing. ABOUT THE BOOK: During the past two decades, Jason Lutes has quietly created one of the masterworks of the graphic novel golden age. Berlin has more than 100,000 copies in print and is one of the high-water marks of the medium: rich in its well-researched historical detail, compassionate in its character studies, and as timely as ever in its depiction of a society slowly awakening to the stranglehold of fascism. Jason Lutes graduated from the Rhode Island School of Design with a BFA in illustration, and in 1993 he began drawing a weekly comics page called Jar of Fools for Seattle's The Stranger. Lutes lives in Vermont with his partner and two children, where he teaches comics at the Center for Cartoon Studies.